The 6-year-old girl presented with an erythema migrans (EM) rash before developing an areolar lymphocytoma involving her breast. She had recently travelled to Germany, where her parents recalled her developing an asymptomatic, annular, erythematous eruption of the right flank 1 week after a “bite,” writes Ogimi. The initial tests for Lyme disease were negative. Then, 6 weeks after the rash appeared another Lyme test was performed which was also negative. Areolar swelling occurred 2 weeks later. 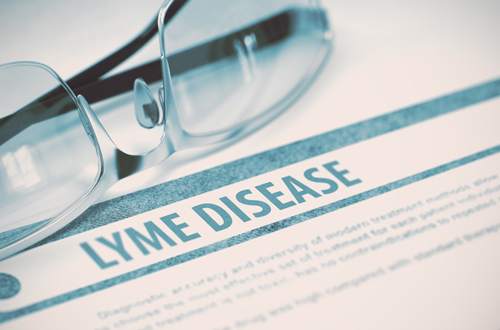 The diagnosis of Lyme disease was not made until after the areolar lymphocytoma developed. The diagnosis was not based on typical presentations. “She denied joint pain, muscle aches, heart palpitations, headaches, or other neurologic symptoms,” states Ogimi. The girl was treated with 3 weeks of amoxicillin which resulted in a prompt resolution of the lymphocytoma. The authors remind doctors of the need to think outside of the box. “Testing for European Lyme disease does not follow the testing algorithm that the Centers for Disease Control and Prevention recommends and may be easily missed,” writes Ogimi. Ogimi C, Crowell C, Boos MD. Areolar lymphocytoma in a child: A rare cutaneous presentation of borreliosis. Pediatr Dermatol. 2017. Mullegger RR, Glatz M. Skin manifestations of lyme borreliosis: diagnosis and management. Am J Clin Dermatol. 2008;9(6):355-368. No Replies to "6-year-old girl with a rare cutaneous presentation of Lyme disease"